In 1978, Love Canal, located near Niagara Falls in upstate New York, was a nice little working-class enclave with hundreds of houses and a school. It just happened to sit atop 21,000 tons of toxic industrial waste that had been buried underground in the 1940s and '50s by a local company. Over the years, the waste began to bubble up into backyards and cellars. By 1978, the problem was unavoidable, and hundreds of families sold their houses to the federal government and evacuated the area. 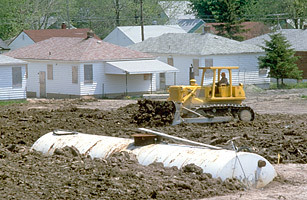 The disaster led to the formation in 1980 of the Superfund program, which helps pay for the cleanup of toxic sites.